By the time one of our recent insurance customers walked through our door, they had nearly been defeated by their own digital transformation efforts. They were frustrated with high spending, several simultaneous and challenging projects, and no clear return on investment to show for their efforts. The race to move from legacy core systems to more efficient and agile approaches is placing a strain on many small and medium-sized insurance carriers. Modernization requires new technologies, skills, and processes. There are a lot of ways to go wrong in a market where hiring talent is quickly becoming more costly and technologies are rapidly advancing. We wrote this article to explain our recommended approach to getting to the “promised land” in an efficient and cost-effective manner. There is a path forward that allows small and medium-sized insurance carriers to meaningfully benefit from digital transformation. Based on our experience, it looks different than the one that many firms seem to take based on their own instincts. We get excited about the value of new technologies for insurance customers, but our core recommendation is straightforward: embrace an agile approach to transforming your existing talent and technical assets. 1. Look to expert help. Without outside guidance, there is an opportunity cost of delay and a higher risk of costly mistakes. Benefit from skilled consultants or advisers who have solved your problems before. 2. Develop a clear-eyed assessment of your gaps. Understand where you shine and where you need to grow. Determine what technologies may or may not be needed. 3. Create and implement a training plan. Instead of hiring new people, emphasize a plan for training your existing staff. They already have a deep knowledge of your business. Prioritize the skillsets you need. 4. Set realistic goals for change. Adopt a phased approach to transformation through proofs of concept that allow your organization to adapt and provide a hands-on opportunity for your staff to apply and develop new capabilities. It sounds simple. As always, the challenge is in the details. Get more of our insurance technology insights right in your inbox and let our expertise help you plan for the future. While your needs may vary, we tend to recommend that insurance firms prioritize the following initial investments. These efforts naturally build on each other, and collectively, they allow you to build a solid foundation for growth. 1. Application Programming Interface (API) Gateway. Add a security layer that exposes an API framework for inter-system communication and standardized interface that is utilized by all stakeholders (internal, external). For example, this would allow an insurer to directly receive a driver's records from the Department of Motor Vehicles. 2. Decision Management. Adopt a comprehensive business automation platform for rules management and resource optimization. For example, this would provide an insurer the ability to instantly pass a policy decision based on their predetermined thresholds to their underwriting team or directly to the end consumer. 3. Microservice Design. Use this distinctive method of developing software systems that focuses on building single-function modules with well-defined interfaces and operations. This breaks a currently monolithic application into individual functional pieces, providing greater agility and the foundation for gradual adoption of modern software architectures. We dedicate the remainder of this article to explaining the value of these investments in the context of the approach above. Our insurance customers tend to look inward for data from their core or CRM systems to make underwriting decisions. This feeds into the larger problem of data inconsistency. Information is typically scattered into multiple data stores, databases, or files and is sometimes duplicated, which prevents or severely impedes automated decision making. Restricted access to pertinent external information sources also limits actuaries, agents, and brokers from making accurate underwriting decisions. This can introduce losses resulting from adverse selection. In today’s interconnected world, new private and public suppliers of information make data available, but carriers need to adopt a new strategy for accessing and incorporating it into the underwriting lifecycle process. This means transitioning from the standard green or amber screens to integrated and modern systems. The API gateway and microservice architecture provides a scalable framework to make public and private information consumable to IT systems that can improve and automate the underwriting process with greater accuracy. Examples of this include information from Motor Vehicle Reports (MVR), the Medical Information Bureau (MIB), lab results, and prescriptions. Knowledge Management is a discipline that promotes an integrated approach to identifying, capturing, evaluating, retrieving, and sharing all of an enterprise's information assets. These assets may include databases, documents, policies, procedures, and previously un-captured expertise and experience in individual workers that focuses on collecting and managing a “single source of truth” with respect to organizational processes and decisions. For more information, read our blog post: Knowledge Management, Digital Transformation: How to Design for the Knowledge Lifecycle. Most insurance carriers fully understand the benefits that come from centralizing knowledge. Separating processes and decisions from their underlying technology (e.g. application programs, database stored procedures, scripts, etc.) and providing uniform access enables carriers to change business rules (i.e. underwriting, claims processing/adjudication, etc.) easily while ensuring compliance and avoiding risk. Centralization gives transparency to business process and decision management systems. Insurance companies tend to have internal groups that operate as individual silos, each with their own systems and hidden sets of rules. Some of these overlap with corporate-wide defined rules. As an organization, it becomes very difficult to make new business decisions or change existing decisions. It makes sharing complex business rules almost impossible and becomes a coordination nightmare. To overcome this dilemma, business decisions should live in a separate centralized repository, rather than in the heads of subject matter experts or scattered across multiple systems buried in code or otherwise obscured and hidden. Policy decisions often incorporate many customer dimensions, each of which are governed by equally varied underwriting thresholds, concealed in code. Therefore, we propose bringing all of these thresholds and guidelines out into the open to be collected into centralized systems. Centralized systems will lead to informed policy decisions that are as open and visible as possible by all stakeholders-- from the most technical developers and architects to the underwriting users themselves. These include risk decisions made based on your established underwriting guidelines, so transparency will give all users the capacity to dissect and understand decisions. For example, in the case of a dispute, an analyst would be able to work backwards to audit and defend the logic that contributed to a decision. No one needs a singular (terrifying and very risky) overhaul that requires a complete rewrite or start from scratch. Rather, we suggest an incremental approach where the solution can be implemented piece by piece. Gradually, microservices will replace parts of an original rigid monolithic application. At the end of this process, these pieces can be deployed in a scalable cloud or hybrid environment, dissipating the strain that we have seen insurers experiencing as they transition from legacy core systems to modern cloud-based services. For more, watch our webinar: Agile Integration in a Microservices Architecture. 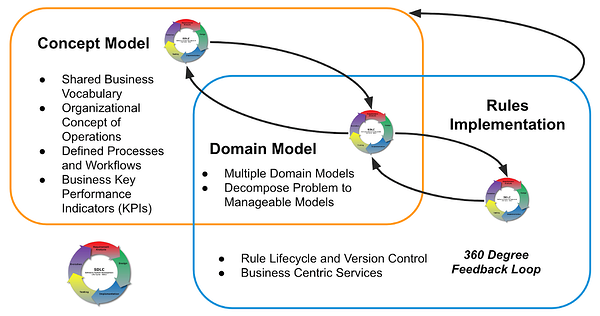 A microservice design simplifies an organization’s solution architecture by dividing software components into small, well-defined, and single-purpose services. This design approach also improves the quality of the software by promoting reusability and composability while improving the maintainability of the code. For example, an underwriting microservice may be responsible for aggregating mortality, motor vehicle information, and medical records that will be used to provide a risk rating. A single microservice would be created that would aggregate one or more microservices (i.e. composability). Each set of information may also come from a different data source with some of them coming from external providers. The microservice interface provides abstraction and enables access to and management of decentralized data. Implementing this design approach aggregates knowledge into discernible and discrete functions to be performed. The single-purpose microservice or Function-as-a-service (FaaS) design provides a platform allowing insurers to develop, run, and manage business functionalities without the complexity of building and maintaining an entire application that consumes this complete knowledge. Microservices with a single responsibility can be utilized by many consumers and it can be modified with minimal impact on other microservices that compose the system. This is where modern software architecture design creates business agility and the ability to respond to market events. Establishing these cornerstone technologies in an integrated solutions architecture provides each insurance carrier with the foundation for a cost-effective, non-disruptive approach and provides the opportunity to develop a plan and train their own resources while modernizing. We recommend that insurers who choose to utilize their in-house IT and business expertise pair up with a solutions partner. Through this approach, you save time, reduce errors, and boost your confidence by laying out a roadmap for the adoption, training, and skills needed for success. A solutions partner can help you validate your goals and strategies early and can also offer implementation support to yield tangible results in as little as eight weeks. We have the experience to prove it. At Vizuri, our goal is to bridge the knowledge gap and help you and your IT organization learn how to expand digital capabilities to realize the benefits we discussed. We know you need a place to start and we’d love to guide and mentor you along the way. Take the first step and tell us more about your organization; we welcome your insights and a peek into your vision. This article was co-written by Ben-Johan van der Walt, Vizuri program director, and Joe Dickman, Vizuri senior vice president.